I've found a wonderful recent book by Nobel-prize winner and experimental psychologist Daniel Kahneman which summarises his work on cognitive biases, judgement, heuristics, and basically how we come to conclusions. You can see the Amazon listing here. I ripped through the first three chapters on the plane from Melbourne to Launceston last night, and was excited to think that my nerdy interest in these things is shared by enough people to have made this book a best-seller. There's a summary of the book at this wikipedia site. The thing that's new to me - even though I've read lots of articles on decision-making in neuropsychology and psychology by Paul Meehl, David Faust, and Howard Garb - is the division of thinking styles into System 1 and System 2. System 1 is the more automatic, intuitive, rapid, frequent, and stereotypic style of thinking that relies on our memories, knowledge, and, I imagine, procedural knowledge to form decisions about the world. System 2 is more slow and effortful, requires more mental effort, and is used for tasks that require logic and calculations. Not surprisingly, people tend to naturally use System 1 more easily than System 2, as System 2 is a whole lot more work. In my reading before this, System 1 was the area of clinical judgements and intuition, and System 2 was characterised by the much-maligned actuarial mode of analysing data. The idea of these systems explains to me why there has been so much resistance by clinicians to research that says we will be more accurate diagnosticians if we rely on Bayesian analyses and prior probabilities than if we rely on our clinical intuitions, which are based on error-prone stereotypes, heuristics, and pattern recognition. That is, the work of Meehl, Faust, and Garb was strongly resisted by clinicians in the early days because it says we need to activate the energy-draining System 2 more often. While the resistance has weakened, I still hear people argue that their clinical judgement is pretty darned good, and that the client is lost in focussing on the test data in a sophisticated psychometric way. I've always thought we need to use both clinical (intuitive) judgement and actuarial knowledge in making decisions - to say we should only be clinicians or psychometricians is throwing out the baby with the bathwater. 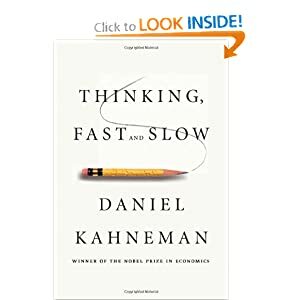 Kahneman agrees that System 1 is excellent at some things, but his book demonstrates that learning about decision errors can help us to engage System 2 to overcome these errors that System 1 evokes - illustrated with examples from optical illusions, making financial choices, and probabilistic thinking. If you'd like to know the things you don't know, if knowing how to reduce your cognitive errors and biases so that you can be a better objective scientist-practitioner, if you want to be the best neuropsychologist you can be, then this book is definitely worth it. And its best-seller status means that it might just give us a link to people who are as mystified by the brain as I am by economics and business - see a review of the book by an economist here.